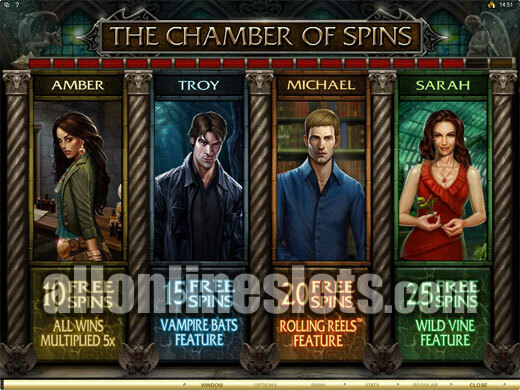 Immortal Romance is a Vampire theme slot with 243 ways and a range of bonus features. It has four types of free spins which can be unlocked as well as a randomly triggered Wild Desire bonus where you can win up to 3,645,000 coins. 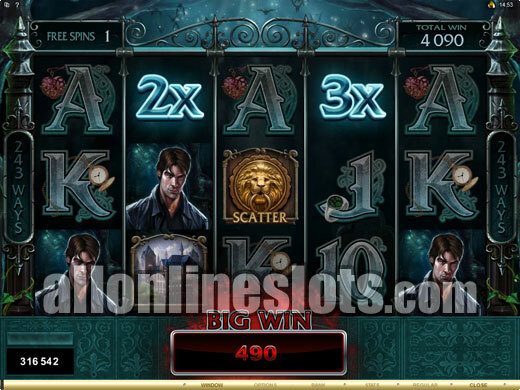 Immortal Romance is a 243 ways slot from Microgaming with a vampire theme. It is clearly cashing in on the popularity of the Twighlight books and films. 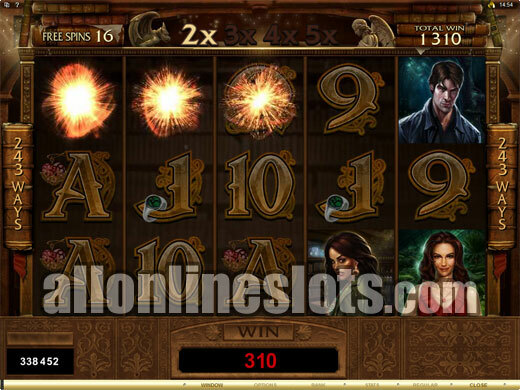 The game itself is based on one of the most popular Microgaming slots - Thunderstruck 2. 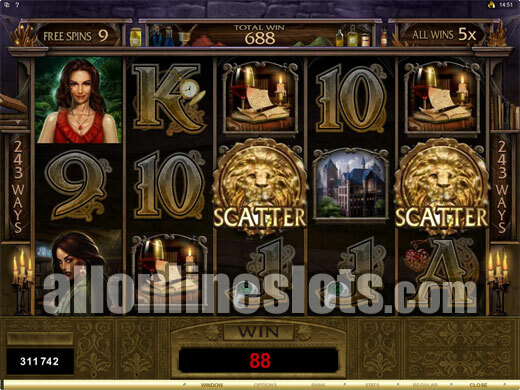 Microgaming have done a great job with the theme in terms of graphics, sounds and features. 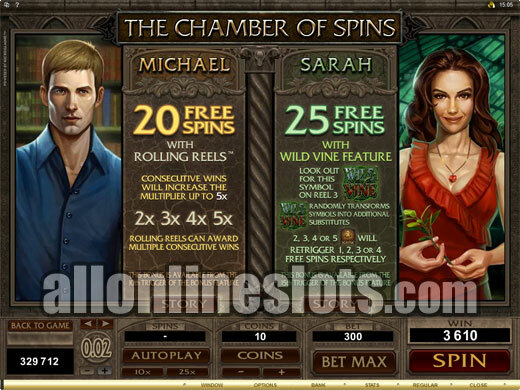 On the reels you have four main characters (Amber, Troy, Michael and Sarah) who each have their own story and unique free spins bonus. Immortal Romance uses the 243 ways format which means you don't have to bet on individual lines. 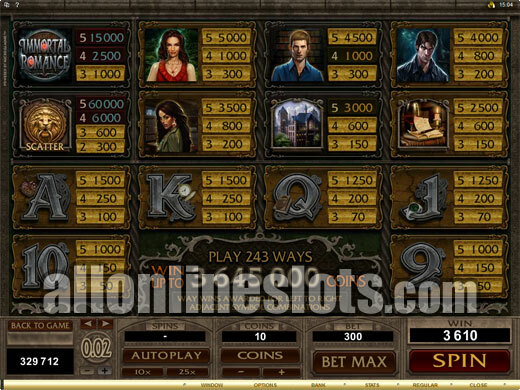 Instead a 30 coin bet activates all 243 ways. You can choose to bet up to 10 coins per way which makes for a 300 coin max bet. You can also choose from several coin sizes that start at 0.01. As usual the wild symbols offers the highest line wins and in this case the Immortal Romance logo is wild. Get five anywhere on the screen aligned left to right and you win 1,500 coins or 15,000 coins at max bet. This might seem like a pretty small top pay but there are several ways to get much bigger wins. After the top pay for the wilds symbols the characters make up the next highest wins win five of a kinds paying 500 (Sarah), 450 (Michael), 400 (Troy) and 350 (Amber). From there the five of a kind wins pay between 300 and 100 coins. Again these might seem low but you can get the same win on lots of different ways in a single spin. 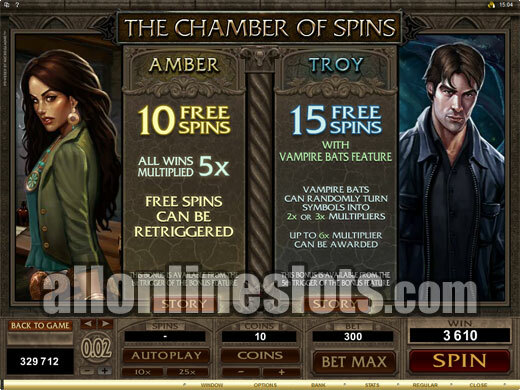 Each one of the free spin options has its pros and cons so the one you choose is a personal choice. We like the Sarah feature as you get a lot of spins and the Wild Vine can spread to a lot of reels. While some massive wins are possible on the free games there is another way to win big on Immortal Romance - the Wild Desire feature. This bonus can trigger at any time during normal play and adds stacked wilds to the screen. 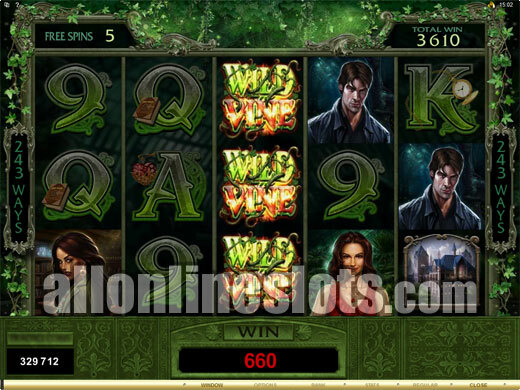 You can get a whole screen of wilds via this feature which awards the games top pay of 3,645,000 coins at max bet. Just like Thunderstruck 2, Immortal Romance has pay table achievements. Every time you get a winning combination that pay turns gold on the pay table. Get every combination and the pay table turns gold. We would have likes to see another feature unlocked but going from Thunderstruck 2 nothing really happens when you unlock all of the gold pays. 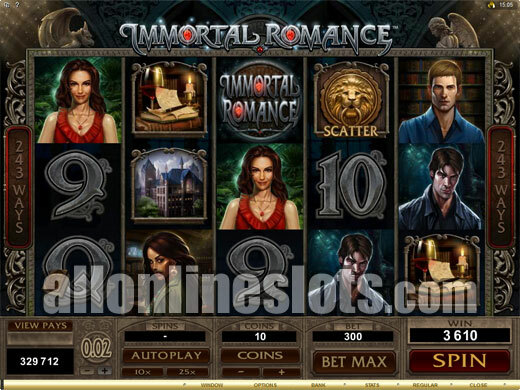 Overall, Immortal Romance is an impressive online slot. 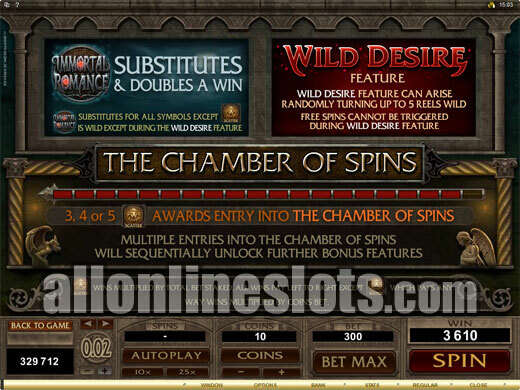 It offers a lot of different ways to win with some nice wins on the base game and even bigger wins on the four free spin bonuses and the Wild Desire Bonus. If you're a Twighlight fan its a must play. Even if you're not a Vampire fan the game is well worth checking out.